Transitional nursery that will grow as our baby boy does. 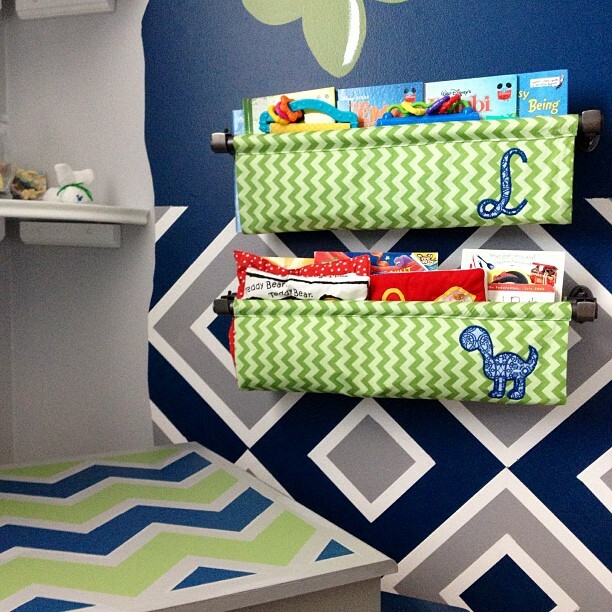 Navy, gray, white, and green with some dinosaurs mixed in. I have seen navy and white nurseries online and I wanted that look with a twist. People usually ask me more questions about the walls. The graphic pattern is not wallpaper, but paint and super affordable if you have a good weekend free to finish the project. Mapping out the pattern was easy, however taping it off was a bit of a challenge. I first painted the bottom half of the room white. With a pencil and a quilting square template (clear, plastic square approx. 12in. x12in. with a 6in square cut out of the middle) I began tracing out the pattern. I turned the square so that it mimicked a diamond and lined the top point up to the top of the white line and traced around the outer and inner square. After that, I just scooted the template and lined up a side with a side and kept on tracing. Next, I taped the walls using just the blue Scotch painting tape. Make sure to tape inside of the square lines. After getting it completely painted, I painted over all the tape with a white coat again. This is important, it helps the tape stick to the walls well and helps the other colors to not bleed under the tape. I used the pencil again to mark a B or a G to indicate where I wanted blue or gray and used a small cabinet roller to paint within the squares. Pull the tape off and vola! I used a few accents such as the rug, light, and side table from Garden Ridge. Stuffed dinosaur and dino night light are from Target. Shelves, curtains, rod, and plywood are from Lowes. Baskets are from Walmart, and furniture is from Buy Buy Baby. Rocking chair was a $40 consignment find but you can buy them new from Cracker Barrel for around $100...much cheaper than a glider! Ottoman was a foam block that I covered. Bedding, artwork, and most accessories I made but similar things can be found on Etsy.com. My favorite thing has to be the tree. I have seen people make bookshelves from branches and such but have never seen anyone use corner shelves to mimic a tree trunk. Don't be afraid to mix colors and patterns. As long as you have a color appear somewhere small at least 3 times in the room it will feel cohesive. Also, if you go dark on the walls, go light on the furniture so that the room doesn't feel dark and heavy. The wall is definitely the highlight for this room. 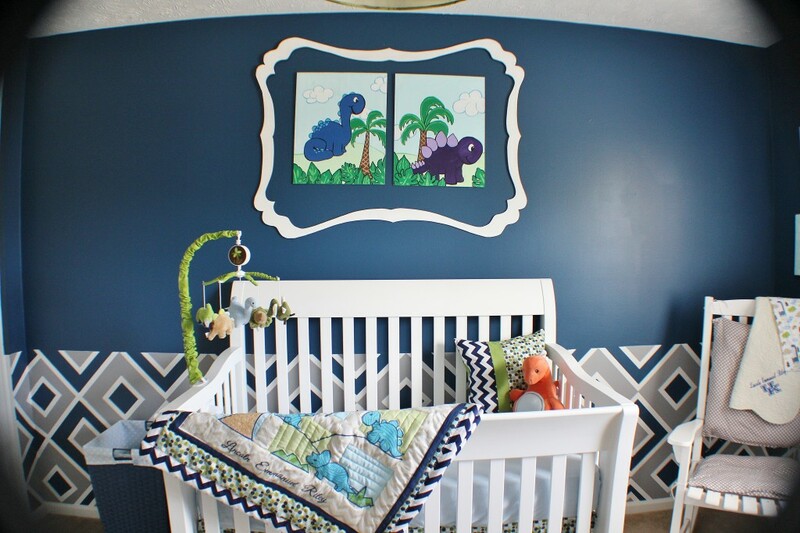 But the dinosaur quilt and artwork above the crib are super adorable. I am an art teacher that loves to decorate spaces for my little ones. My husband also teaches so budgets are usually tight. I love creating spaces on a budget and making them as unique as possible.